This briefing also covered meetings between State Department officials and their counterparts abroad. “We discussed new ways to deprive the regime of revenues to terrorize people and to terrorize other nations. We discussed how Iran uses embassies as cover to plot terrorist attacks,” the senior State Department official explained. “The most recent example is the plot that the Belgians foiled, and we had an Iranian diplomat out of the Austrian embassy as part of the plot to bomb a meeting of Iranian OPPOSITION leaders in Paris. And the United States is urging all nations to carefully examine diplomats in Iranian embassies to ensure their countries’ own security. If Iran can plot bomb attacks in Paris, they can plot attacks anywhere in the world, and we urge all nations to be vigilant about Iran using embassies as diplomatic cover to plot terrorist attacks,” the official added. The Iranian regime has a history of plotting and staging terror attacks in the Green Continent. “The most recent plot in Europe by Iranians is another chapter in a long history that dates back to 1984, when Iran was starting these hijackings on commercial airliners, bombings, assassinations,” the official continued. US #StateDept Official:".. #Iran uses embassies as cover to plot terrorist attacks." In reference to a question on the party responsible the State Dept. officially explicitly said Washington believes the Iranian regime was behind this plot and described as “ludicrous” Tehran’s claims of this being a “false flag” plot carried out by the People’s Mojahedin Organization of Iran (PMOI/MEK). The Iranian Regime has just passed its 39th anniversary, but it should not see its 40th. In 1979, Ruhollah Khomeini returned from exile to hijack the popular movement to overthrow the dictatorial monarchy. He took power from the people who had done all the hard work and instituted his own theocratic dictatorship. Now, there is again a popular people’s protest in Iran- the biggest since 1979- and many in the West are wondering if this will be the end for the mullahs. The protests, which began over a draft budget that would slash subsidies for the poor and increase military spending, has shaken the Regime by taking on an anti-regime slant. Protesters attacked the buildings owned by suppressive forces, called for the removal of President Hassan Rouhani and Supreme Leader Ali Khomeini, and rejected Iran’s malign military escapades. The Regime’s suppressive forces were stretched to breaking point and had to call back forces from fighting on behalf of Bashar Assad in Syria to try and suppress the protesters. The Regime reacted with violence, shooting at least 50 people in the streets, arresting 8,000, and killing 12 via torture in prison. All of this suggests a Free Iran is coming sooner rather than later and it is time for the West to embrace this new reality. The Iranian Regime and its apologists have long lied about the Regime’s popularity with the people, stability, regional meddling, suppression of the people, and its political makeup. Simply, the Regime is incredibly unpopular amongst its people but it has long suppressed the people and distracted the world from this through international interference. The Regime is not made up of “moderates” and “hardliners” because it doesn’t allow moderates to take political office, but it does allow its politicians to play at being moderates (making some nice speeches about human rights, not shouting “Death to America”) in order to gain concessions from the West when needed. Case in point, the nuclear deal, which did not improve the lives of the Iranian people but only the very rich. The West much challenge these lies, put pressure on the Iranian Regime, and support the Iranian people. INU – After many years of the US attempting to appease the Iranian regime, American commitment to economic sanctions has been effectively reestablished, and even expanded, with President Trump’s announcement on October 13 that his administration would be targeting the entirety of the Islamic Revolutionary Guards Corps for its support of global terrorism and its crimes against the Iranian people. Trump has said that the Iranian people are the “longest suffering victims” of the Iranian regime. He and his foreign policy advisors have clarified that the emerging Iran strategy recognizes the difference between the government of the Islamic Republic and the people of Iran. Many believe that the Trump administration sees a need for regime change and is willing to pursue this goal. Secretary of State Rex Tillerson told a House Foreign Affairs Committee hearing that US policy in the Middle East should include the promotion of those domestic voices in Iran who support transitioning its government from its current dictatorship to a Democracy. Still, Tillerson did not specify who those voices are, although the resistance against the Islamic Republic is a known quantity. The US has been slow to change its stance regarding the resistance movement, even though many American lawmakers have expressed support for the National Council of Resistance of Iran (NCRI) and its main constituent group the People’s Mojahedin Organization of Iran (PMOI, or MEK in Persian). On both sides of the Atlantic, the NCRI and MEK have widespread support among western politicians, who have given their support to the resistance’s agenda, including human rights, freedom of speech, freedom of expression, gender equality and a non-nuclear Iran, as has been articulated in the 10 point plan of the NCRI President, Maryam Rajavi. The NCRI and MEK enjoy bipartisan support in Washington, as well as across Europe and in the Islamic world. The MEK and NCRI resorted to an unprecedented legal and political campaign and was able to show that it is a legitimate resistance with support inside of Iran and among the Diaspora. It was de-listed by then-Secretary of State Hillary Clinton and the Obama administration. The Trump administration believes that the entire notion of moderates within the Iranian regime is a fantasy. The first term in office of Iranian President Hassan Rouhani oversaw a surge in executions and a severe crackdown on dissents throughout the country. Additionally, the UN special rapporteur on the situation of human rights in Iran, Asma Jahangir, confirmed this in her October 25 report to the UN General Assembly. She said that while there are hopeful signs in the form of Rouhani’s statements, the actual human rights conditions in the Islamic Republic have only deteriorated. There has been a reemergence of Iranian propaganda targeting the MEK, NCRI and their affiliates. It is believed that this propaganda by Tehran and its lobby will intensify as the US continues to pursue an assertive strategy with regard to the Islamic Republic. As well, MEK, NCRI activism, particularly inside of Iran, has seen a significant upswing in recent months. In fact, there has been increased activism regarding the the massacre of 30,000 political prisoners, an overwhelming majority of them MEK supporters, during the summer of 1988. The US has adopted a new Iran policy, and the Trump administration must build countermeasures to disinformation in its emerging Iran policy. The White House may soon declare itself an ally to the NCRI and a supporter of the cause of domestically-driven regime change in Iran. Now is the decisive time for President Trump to formally recognise the Iranian Resistance, the National Council of Resistance of Iran (NCRI), and officially invite their leader Maryam Rajavi and her delegation to the White House.By lending Legitimacy and Creedence to the Iranian Resistance, Trump will be metaphorically speaking plunging a dagger into the lawless Mullah’s hearts on the International scene. Instead, to consolidate their power, the Iranian regime has relied on the typical tools of oppression, including the creation of a paramilitary and judiciary system that touches every section of Iranian society. The regime, using its lobby and appeasers, have been quick in attacking any publication or personalities that dare to speak up about the quest of the Iranian people to achieve their original dream of a democratic Iran. Anyone who dares to talk about “regime change” is targeted for repressive measures. The MEK/PMOI have been high on the regime’s list, since the MEK/PMOI are the most dedicated and organized opposition with extensive routes and support at home, with the ability to materialize regime change. The people’s Mojahedin Organization of Iran (PMOI/MEK) has been the subject of propaganda campaigns by the Iranian Ministry of Intelligence and Security (MOIS) at home and by regime lobbies and appeasers throughout the international community. This campaign is focused on discrediting the MEK/PMOI, by saying there is no democratic alternative to the Iranian regime and that regime change will result in war and increased instability within the region. But why is the MEK/PMOI being targeted so directly? The MEK/PMOI is the oldest, largest, and most popular resistance movement within Iran. They form the core of the National Council of Resistance of Iran (NCRI), which is a coalition of opposition groups from all sectors of Iran. The PMOI/MEK was founded in September 1965 by three Iranian engineers who wanted to replace the Shah’s dictatorship with a democracy. It is this continued support of democracy that has kept the MEK/PMOI so popular among Iranians. The MEK/PMOI believes that Islam is inherently tolerant and democratic, and fully compatible with the values of modern-day civilization. This vision is the cure to the current spread of extremism, which can be traced back to Iran and its mullahs. Yet, during the time of upheaval after the revolution, the MEK/PMOI leaders witnessed Ayatollah Khomeini’s hijacking of the revolution to create his theocracy. Khomeini’s response to the efforts of the MEK/PMOI to stop the rise of this theocracy was brutal repression throughout the 1980s, including the massacre of some 30,000 political prisoners who were primarily members or supporters of the MEK/PMOI. Despite the escalation of attacks by the Islamic Revolutionary Guard Corps (IRGC) throughout the years, the MEK/PMOI has never stopped promoting a pro-democracy vision of Iran. These actions demonstrated that the regime would only hold power by using brutality and repression to keep the Iranian people under their control. Despite this, the MEK/PMOI has continued to receive support and demonstrations held throughout Iran show that the Iranian people are not cowed by the regime, but still believe in a free Iran. In the recent 2017 election, hundreds of video clips and photos of banners and placards hanging from pathways and auto routes on billboards, were published on Telegram and YouTube channels, showcasing the vast magnitude of the activities of those who support the MEK/PMOI. The slogan, “My vote is regime change”, echoed throughout the country. The regime’s election was therefore quickly ended in the first round to avoid further opportunities for protest. Yet, internally, the regime is suffering from deep divisions about how to ensure its survival, as the domestic unrest continues to grow. This support has not gone unnoticed by the regime, whose leadership has continued to try to clamp down on the MEK/PMOI by blocking access to the internet and monitoring social media posts and clips. They have also tried to block the MEK/PMOI Telegram website and associated channels, only to be rejected each time. In addition to using blunt force on people, the regime invests heavily in the massive propaganda effort it mobilizes through state-controlled media and via its lobbies and paid agents abroad, in order to discourage more support for the MEK, which is the main drive for regime change in Iran. 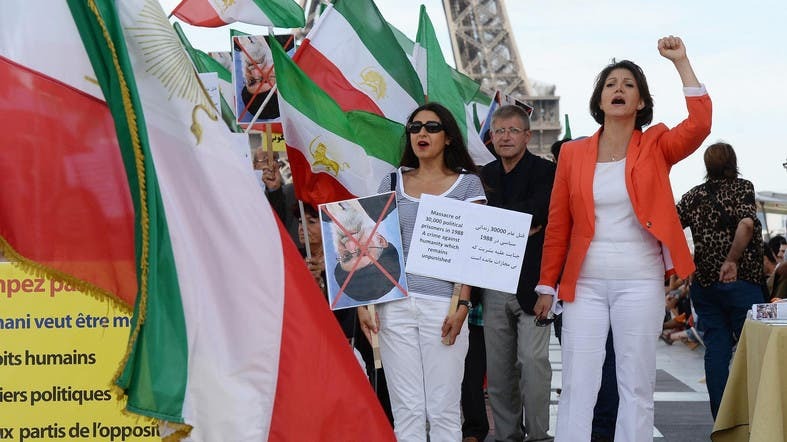 The extent of the anti MEK propaganda has increased particularly after the July 1, 2017 gathering in Paris, which had a clear message, “Regime change in Iran is within reach.” Some 100,000 Iranian diaspora and supporters of MEK gave energy to it. This is why it serves the regime’s purposes to continually dangle the threat of war over the heads of its people. It also helps the Iran lobby’s PR efforts to cast Iran like some poor, defenseless nation under threat by the big bad U.S. and its allies, such as Saudi Arabia or the Iranian resistance movement, the MEK/PMOI. Trita Parsi, the head of the National Iranian American Council and staunch advocate for the Iranian regime, appeared on Bloomberg to beat the war drum again, as well as attacking the Trump administration for not living up to the Iran nuclear deal, even though Secretary of State Rex Tillerson announced the renewal of the compliance certification for another 90 days. But the Trump administration also is asserting that Iranian regime’s development of ballistic missiles; support of terrorism and militancy; complicity in atrocities by the government of Syrian dictator, Bashar Assad; cyberattacks on the U.S.; and other actions “severely undermine the intent” of the nuclear accord and support additional sanctions as a response to these actions. The real threat to the Iranian regime though lies not within sanctions, but in the simple acts of defiance that the Iranian people undertake themselves such as the hanging of banners on Tehran’s overpasses bearing the image of MEK/PMOI leader Mrs. Maryam Rajavi; an act punishable by death if the perpetrators were caught. The regime is also threatened by every protest over low wages or unsafe working conditions. In many ways large and small, the process of regime change can happen slowly, methodically, and inexorably. Mrs. Rajavi, in a recent speech at the annual gathering of the Iranian resistance movement and supporters of MEK/PMOI, opined that the movement did not require outside assistance from governments, such as the U.S., to succeed. It only needed the recognition by such governments to be empowered to bring about peaceful regime change and give birth to a democratic Iran. The turning point came on 20th June 1981, when the MEK called a demonstration to protest at the regime’s crackdown, and to call for political freedom which half-a-million supporters participated at. Khomeini ordered the Revolutionary Guards to open fire on the swelling crowd, fearing that without absolute repression the democratic opposition (MEK) would force him to engage in serious reforms — an anathema as far as he was concerned; he ordered the mass and summary executions of those arrested. Originally published at iranarabspring.wordpress.com on July 30, 2017. Thanks for your post. Very interesting: in Western countries, people are not fully aware of the Revolution of 1979 and is consequences. Thank you dear Nathalie for your comment, yes indeed, your support is valuable for me, you are a great friend and supporter for me, thanks again and good luck my friend. New sanctions on Iran are a step towards taking power away from the Islamic Revolutionary Guard, but there is much more the US and its allies can do. The US House of Representatives on Tuesday voted overwhelmingly to rally major new sanctions on Iran, parallel to measures on North Korea and Russia. To impose additional sanctions on Iran’s defense sector, The House voted 419–3, moving the bill forward to be signed by President Trump. Coming after three weeks of negotiations, this bill “tightens the screws on our most dangerous adversaries,” explained House Speaker Paul Ryan. The bill sanctions anyone associated with Iran’s Islamic Revolutionary Guard Corps (IRGC) or anyone whom the US determines is complicit in Iranian human rights violations. Anyone sanctioned under the act may later have sanctions removed after a five-year review. Iranian opposition leader Maryam Rajavi welcome the US House of Reps’ new sanctions and terrorist designation of IRGC as essential to rectifying the policy of appeasement and described the act as a “step in line with the Iranian people’s desires and peace in the region,” especially as it turns up the heat on Iran’s Revolutionary Guards. The new administration coming to Washington has promised many things, not least of which includes a reexamination of US policies towards Iran. Though the Obama administration did all it could to sell the nuclear deal as a victory, at best it has deferred the ultimate questions about how to deal with the regime in Iran, and at worst it has emboldened their belligerence in the region. A successful policy vis-a-vis the regime in Tehran has seemingly eluded Republicans and Democrats for the last 16 years. It may be time to try something new. Middle Eastern states when confronted with intense instability can result in the spread of insecurity across the globe. This includes the threat of terrorism in Europe and the US, and the increase of sectarian conflicts abroad. Yet there are no easy solutions to these issues. The prospects of being dragged into another war are not appealing to anyone, yet neither can we afford to sit back and watch radical terror spread throughout the Middle East. Unfortunately, the appeasement policy by the West for the past two decades has exacerbated this problem, directly or indirectly supporting or engaging Islamic fundamentalists at the expense of their main secular and progressive opposition. The cold war policies of arming jihadists and undermining democratic groups is a direct example of this. It is time to employ a reversal of this policy. A common denominator underlying the rise of ISIS, and the spread of instability and fundamentalism, is none other than the regime in Tehran. No one can deny this. Yet at every turn, we are told that the only solution is one which engages the mullahs and strengthens their grip on power. The time for such thinking is at an end. The regime has been reluctant to make good on promises of change and thus far has continued its brutal repression of dissidents while maintaining an aggressive policy in the region. The question of how to guarantee a long term shift in the behavior of the Iranian regime remains unanswered by Iranian regime apologists. The only long term policy which can guarantee a fundamental change of behavior in Iran, and sets an example for hope and change abroad, is one which recognizes the legitimate rights of the Iranian people to bring about democratic change and topple the theocratic fascist state in Iran. It is the time that the United States firmly aligned itself with the Iranian opposition which embraces democratic change, freedom and liberty, and secular governance. The Iranian people and their organized resistance should be the primary negotiation partners and allies, not the ruling mullahs. The principal opposition to the Iranian theocracy, the National Council of Resistance of Iran (NCRI) and its main pillar, People’s Mojahedin Organization of Iran (PMOI/MEK) is one such organization. “In history, the name of your president elect, Maryam Rajavi, will go down in the same tradition of fighters for freedom as Washington, Lafayette, and Garibaldi,” said former House Speaker Newt Gingrich in a speech at the annual NCRI convention held this year on July 1st in Paris. Rajavi advocates a new future of Iran. This includes a ten-point plan for a democratic secular republic in Iran, free of nuclear weapons, capital punishment, and tolerant to all religions, ethnicities, and ideas. Shahriar Kia is a human rights activist and a political analyst writing on Iran and the MIdlle East. As a member of the Iranian opposition, he dedicated his life for the freedom of his people in Iran. He graduated from University of North Texas (USA). Originally published at practicalpoliticking.com on July 28, 2017. In Iran, 1980s is known as a bloody decade as thousands of political opponents were executed in brutal mass murder. In the summer of 1988, a massive slaughter took place in Iran’s prisons. Ayatollah Hossein Ali Montazeri, the successor of Khomeini, was dismissed as a result of his objection to this massacre. In September 2016, an audio tape from a meeting of the late Ayatollah Montazeri with members of the committee of executioners (commonly known by Iranians as death committee) was published by his son, which led to his arrest and prosecution. In the audio tape, Ayatollah Montazeri described this massacre as the worst crime in the history of the Islamic Republic, and named Ibrahim Raisi, Mostafa Pour Mohammadi, Hossein Ali Nayeri and other coordinators as criminals. The families of victims of 1988 massacre are currently seeking justice for their loved ones who were secretly executed and buried in mass graves at nights without any due process. The call for justice led by Iranian opposition, which started last year, caused a challenge for both of the regime’s factions during the presidential elections. What he meant was that the heads of this government are executioners in the eyes of the Iranian people, and this will create internal and international consequences that must be avoided. Additionally, state-controlled media released Khamenei’s praises about the “Nimrooz” movie, a production funded by the Iran revolutionary guard corps (IRGC) aimed at demonizing the People’s Mojahedin Organization of Iran (PMOI/MEK), a prominent opposition movement. The reason of making this film was to prevent another uprising similar to 2009, in which the MEK played a pivotal role in organizing protests against the regime. After the release of the film, former political prisoners and families of executed prisoners condemned the events showed during this film and called it as a distortion of the reality in history. In another hasty event, the Iranian regime put up a show, a tour of Evin Prison, to international delegations. The purpose of holding this tour for 50 ambassadors of different countries on July 5 was to destroy and wash the traces of the regime’s crimes. Amnesty International called this tour a “crude PR Stunt” and mentioned in a statement that Evin prison is known in the world as a symbol of wide political oppression in Iran. The executed prisoners of the 1980s were members and supporters of opposition groups of the Iranian regime, such as the MEK, Marxists and Kurds. MEK members and supporters accounted for more than 90 percent of the victims. Beleaguered in Iraq in the post 2003 era, the MEK experienced a very difficult and dangerous situation, particularly over the last decade. Under such circumstances this movement has been able to attract public sympathy through mass media, especially satellite and Internet. Currently, the Iranians and the International communities have become curious to acquire knowledge about this movement. In face of an inhumane siege and the looming danger of further massacres, members of MEK put up a heroic persistence and defended themselves with bare hands and survived the many plots of their enemies. Eventually, the MEK members exited Iraq and resettled in Albania. Now, the MEK is finding a fast-growing following in Iran, especially among the youth, creating a serious challenge for the Iranian regime. With the rise of the call for justice for 1988 massacre, the Iranian regime is trying to destroy the evidence of this brutal murder and discourage the youth from joining the opposition movement. It has produced a propaganda film to change the place of martyr and executioner, and destroyed the mass graves of executed prisoners. The Iranian youth, even the children of regime officials, want to know the reality and the truth of what happened in the 1980s, and the history of the movement that recently held a huge gathering in Paris. Also, they want to know what message it conveys for them. Meanwhile, Khamenei has ordered to produce another film for Assadollah Lajevardi, the former head of Evin prison known as “Evin hangman,” who was one of the criminals 1988 massacre. “Hopefully, you can do something for Lajevardi as well. He is one of the figures who deserves something. His name was mentioned in this film, but he is one of the persons that we called him ‘strong man’ before,” Khamenei said. It seems the spilled blood of the innocents who were ruthlessly murdered in Iran is now undermining the foundations and the very existence of the Iranian regime. Sympathy for the victims and their family has now penetrated the depths of the Iranian society and has become an endless nightmare for regime.